I wanted to check out Bar | Kitchen’s Social Sunday but they were unfortunately closed due to extenuating circumstances. 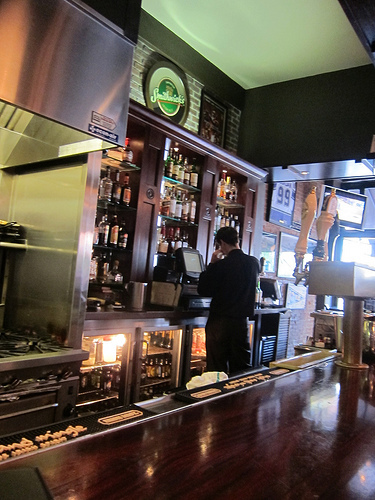 Since I had plans at LA Live later, I decided to check out Riordan’s Tavern. 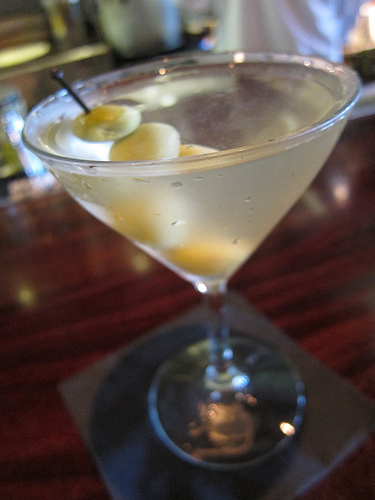 I was happy to see it was happy hour (every day from 3-6PM) and my martini was only $5. When the bartender asked vodka or gin, he seemed surprised I wanted gin. And then I was surprised it was a good one. Icy cold, swimming in botanicals. I should have asked what gin they used as their well. I didn’t look when the bartender made it. Did he shake or stir? It seems stirred which is how I like martinis. Perhaps I should have gotten a twist (to better complement those botanicals) but I was feeling snacky. Olives, then. Usually when I walk into a new bar, I like to find a seat at the bar. There were a group of guys taking up a corner then a few open seats closer to the grill area. I found it a bit odd to see how small the bar was for a place called a tavern. I opted to sit in front of the grill rather than smushed into a corner and the wall. It was hot. I had an unintentional facial. Being by myself, it’s easy to blend in and listen to the bar talk. The bartender handed me off to a cocktail server who didn’t know what a Snakebite was (it was on their happy hour menu- Harp & cider). She was bubbly, sweet and told me she couldn’t wait for a glass of wine soon. I liked her. A few days ago, I read this great article on Shake Stir on how to drink like a lady at a bar. There were 10 rules which I mostly agree with. But I’d like to get to #9- no texting. The article talks about how being on your phone makes you look insecure or bored. True, it can. But like the person eating by themselves at a restaurant with a book, I really don’t see anything wrong if- this is a big IF– you’re in for a meal or drink by yourself. Meaning you’re not there to pick up anyone. I also know it’s not the bartender’s job to entertain me every 5 seconds. There’s only so much interaction you’re going to have, especially if the bar is slammed. And those guys in the corner? No, not happening. On this early evening, I couldn’t help but overhear one of them didn’t like Jameson. That’s fine. But Riordan’s Tavern is an Irish bar. Well, ostensibly Irish. They seemed to have more Scotch than Irish whiskey but I digress. Then he said something that made me want to throw something. He liked fruity vodka and in fact didn’t like the taste of booze. Hello, still drinking the gin martini. See this cell phone? I’m tweeting about you. Fine, fine, I shouldn’t judge. Oh, maybe that’s just me. Perhaps everyone thinks you’re empowered, that you love hanging out by yourself and you want to make new friends. The reviews are rather poor for this bar. Complaints of service, food and pricing seem to crop up over and over again. I have no complaints. For that brief hour, it was fascinating to watch a slice of life at a sports bar. The bartender seemed to love to delegate duties. He even asked a line cook to make a Long Island iced tea (oh, it’s one of those types of bars). A trio appeared next to me. The women wanted Bud Light which the bar didn’t carry. They made do with Miller Light. I was a bit disappointed of their choice. But I had to remind myself where I was. I was once told every bar has its time and place. On this non-busy Sunday afternoon, this bar was there for me. This entry was posted in bar snark, bar stories, bars, cocktails, happy hour, la, la cocktails, los angeles and tagged bar snark, bar stories, dtla, happy hour, irish bar, riordan's tavern, sports bar. Bookmark the permalink.